Charles Ferguson’s film, Inside Job, winner of the Academy Award for Best Documentary, is now available to embed online thanks to the Internet Archive. It can be watched in its entirety for free below. The DVD is also available for purchase at this link. 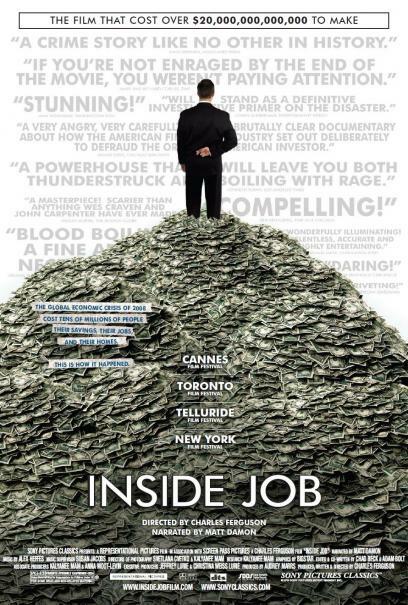 'Inside Job' provides a comprehensive analysis of the global financial crisis of 2008, which has caused millions of people to lose their jobs and homes in the worst recession since the Great Depression. Through exhaustive research and extensive interviews with key financial insiders, politicians, journalists, and academics, the film traces the rise of the rogue industry that has corrupted politics through captured regulation. It is highly recommended. This video should be mandatory for every student in the United States. They must view its contents from the beginning to the end. As questions arise there must be discussion groups formed to help clarify any questions that one may have concerning terminology, auditing practices, conflict of interest, and any topic that arises from questions related to the activities of these individual business men and women who were involved in running or managing the largest businesses in the U.S. or World.